Chile's government and its neighboring countries maintain cordial relations, but every once in a while there's a reminder of festering hostilities. The latest case occurred this month, when a video clip on YouTube showed the head of Peru's army making mortal threats against Chileans. In the video, Gen. Edwin Donayre talks of preventing Chileans from entering Peru, and if they do, they'd be sent back home "in a box." If there weren't enough boxes, they would return in plastic bags, he continued. Peruvian President Alan Garcia apologized; Donayre did, too. After the diplomatic mess, Donayre appears to be retiring a bit sooner than planned. Chilean President Michelle Bachelet has said she considers the matter settled. Update: Chile turned back Peru's naval commander and a Peruvian frigate from the Exponaval trade show, citing the Donayre controversy. Donayre retired Dec. 5, as originally scheduled, and many Chileans want him punished in some way. At his send-off, the general was full of bravado and was carried on soldiers' shoulders. Peru's defense minister may punish the soldiers, but there's no apparent reprimand in store for Donayre. The first five of 30 Gepard 1A anti-aircraft artillery vehicles have been delivered to Chile's army. The self-propelled systems were acquired as surplus from the German army and will undergo some upgrades, according to Enfoque Estrategico. Those include an improved fire-control system and perhaps the addition of Mistral anti-aircraft missiles. The units are being deployed to the 1st Armored Brigade (based in Arica), the 2nd Armored Brigade (in Iquique) and the 3rd Armored Brigade (in Antofagasta). The acquisition, which had been rumored for years, gives the army an improved air-defense capability. Up to now, that force consisted of some self-propelled 20mm guns and shoulder-fired Blowpipe missiles. Reports have said the army is still looking to purchase air-defense missiles. Chile's government controller plans to take a role in authorizing all equipment purchases for the military, sparking concerns that defense programs will be put in full view of potential adversaries. The decision arose from a new interpretation by the controller's office of its responsibilities, according to enfoque-estrategico.com. With the change, the agency gains a critical role in any weapons acquisitions, something that up to now has been largely trusted to the armed forces themselves. Meanwhile, the finance ministry's new spending restrictions (due to the global credit crisis) are affecting military operations, El Mercurio said, quoting a defense analyst. Funds from the state-owned copper company have been frozen until a new defense-budget reform is approved. 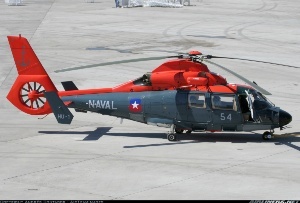 Chile's navy acquired four SA-365F Dauphin II helicopters that had been retired from the Irish Air Corps. The deal adds to four other Dauphins that were acquired second-hand in 2005-06 in Brazil. The latest helicopters were purchased from a U.S.-based company for about $23 million, according to The Irish Times. The newspaper said the Air Corps sold the aircraft to the company, which made upgrades and in turn sold them to Chile. The Dauphins are used for patrol and search & rescue operations. They can also operate on the new offshore patrol vessels, and several more may be acquired to watch over Chile's extensive coastline. The Dauphins are replacing about a half-dozen outdated BO 105 helicopters. Chile is behind on a pledge to remove all land mines, having cleared out just 14% of all minefields so far. Defense Minister Jose Goñi said the government will probably notify the signatories of the Ottawa Treaty that Chile won't meet its 2012 target date. So far, 18,000 antipersonnel and 21,000 antitank mines have been removed from the borders with Peru, Bolivia and Argentina. But more than 150,000 mines remain buried. The army is now using a specialized excavator provided by the U.S. to clean out an area near the Peruvian border. U.S. military personnel have been assisting Chile in the effort. Chile laid the mines in the 1970s, when Peru and Argentina threatened to settle border disputes by force.